The Pacific Crest Trail, May 14, 2004. Taken near the southern entrance to the Mount Jefferson Wilderness Area from Highway 20 Santiam Pass, Oregon. In addition to being unsightly and dangerous due to the threat of falling limbs, trees and reburning, much of this trail segment has been closed or difficult to traverse since the 2003 B&B Fire Complex Fire because of accumulating debris. (Photo by B. Zybach, Oregon Websites & Watersheds Project, Inc.). Vegetation. 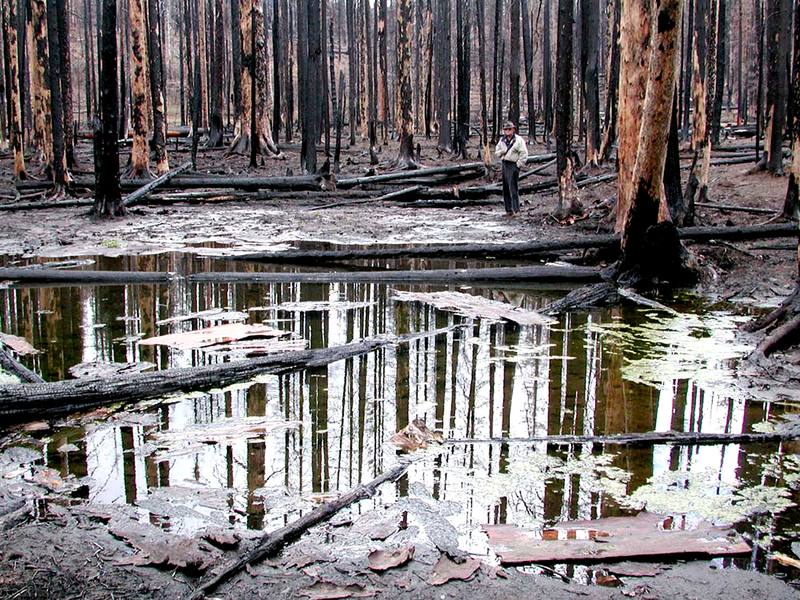 Standing timber losses have often been considered in wildfire damage estimates, but loss of future harvests from destruction of growing stock has been less frequently accounted for. On public lands losses include destruction of forage on grazing lands, secondary forest products destruction and/or degradation, and loss or degradation of wildlife habitat (including Endangered Species populations and protected habitats). On private land vegetation losses include timber and agricultural crops burned or impacted by wildfire smoke, such as winegrapes. Indirect losses include mortality of growing stock, the pre-fire investments used to establish or maintain such stock (such as nursery or planting costs and fencing), and irrigation systems. Post-fire losses include seeding, planting, and other revegetation costs, landscape rehabilitation, lost timber growth, and related product sales, business, job, and tax losses. Kline, Jeffrey D. 2004. Issues in Evaluating the Costs and Benefits of Fuel Treatments to Reduce Wildfire in the Nation's Forests. USDA Forest Service, Pacific Northwest Research Station, Research Note PNW-RN-542: 46 pp. Lankoande, Mariam and Jonathan Yoder 2008. "Fuel Treatment and Suppression for Wildfire Risk Mitigation," IN: Gonzalez-Caban, Armando, Proceedings of the Second International Symposium on Fire Economics, Planning, and Policy: A Global View. General Technical Report PSW-GTR-208, USDA Forest Service, Pacific Southwest Research Station, Albany, California: 720 pp. : 303-309. Loomis, John and Armando Gonzalez-Caban 1998. "A willingness-to-pay function for protecting acres of spotted owl habitat from fire," Ecological Economics. Vol. 25: 315-322. Mason, C. Larry, Bruce R. Lippke, Kevin W. Zobrist, Thomas D. Bloxton Jr., Kevin R. Ceder, Jeffrey M. Comnick, James B. McCarter, and Heather K. Rogers 2006. “Investments in Fuel Removals to Avoid Forest Fires Result in Substantial Benefits,” Journal of Forestry. January/February: 27-31. Zouhar, Kristin, Jane K. Smith, Steve Sutherland, and Matthew L. Brooks 2008. 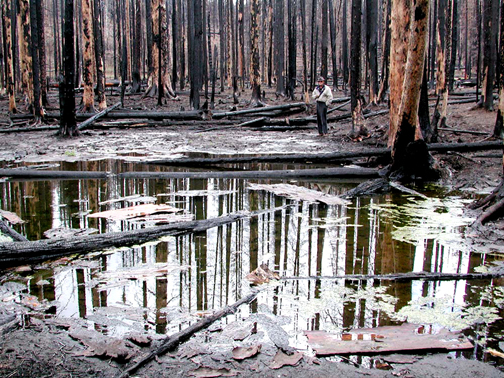 Wildland Fire in Ecosystems: Fire and Nonnative Invasive Plants. General Technical Report RMRS-GTR-42-Vol. 6, USDA Forest Service Rocky Mountain Research Station, Ogden, Utah: 355 pp.